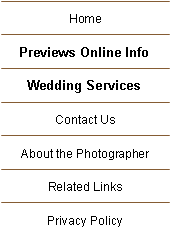 This is a more complete wedding photography service. It includes up to five hours of digital photography and a $400 print credit. Many album choices are also available. · Five hours of photographer time. · Online proofing and ordering for family and guests. · Images placed in a password protected website for 60 days following your event.